The Department of Languages and Culture Studies is proud to announce its 4th Multi-language Poetry Slam on February 22, 2018, at 7 p.m. in Cone University Center After Hours. 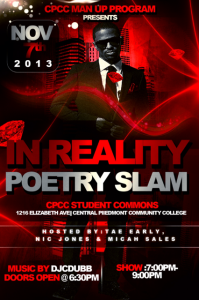 All students and faculty with a passion for poetry and spoken word are invited to participate. We welcome authentic work in English, another language or a mixture of languages. The topic is your choice. In addition to authentic work, we also accept translations of poems by published authors since translation is also a creative act. All work must be submitted by Monday, February 19, 2018. Share your passion for poetry and win cash prizes! For more information and sign-up, please contact mldelgad@uncc.edu and/or your language instructor. You’re invited to the “In Reality” Poetry Slam, presented by the CPCC MAN UP Program. WHEN: Thursday, November 7 at 7 p.m.
For more information, contact the MAN UP office at 704.330.6142 or at 3MP@cpcc.edu. 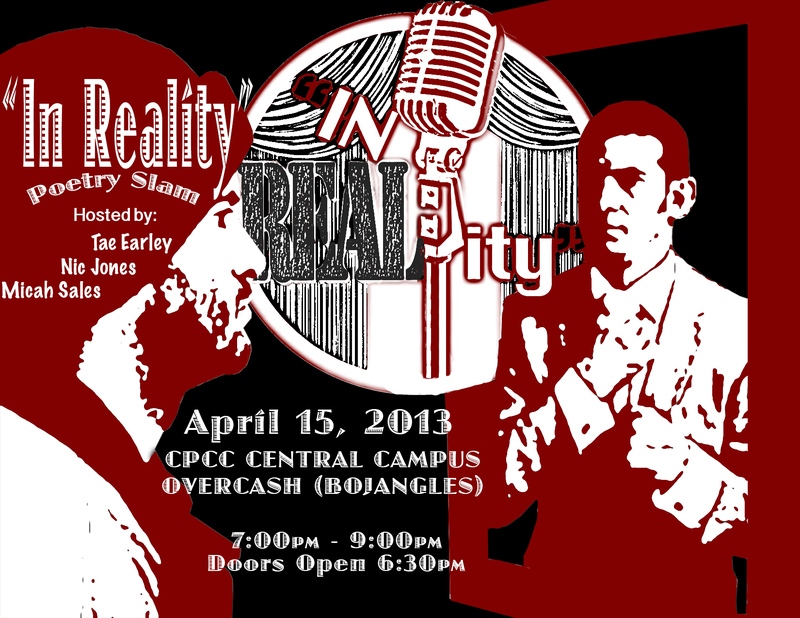 You’re invited to attend the “In Reality” Poetry Slam on April 15 from 7 – 9 p.m. in the Overcash Building (Bojangles) on Central Campus. The event will be hosted by Tae Early, Nic Jones and Micah Sales.